The senior staff members declined to reveal how much they earn when grilled by the committee earlier today. Chief Executive of Rehab, Angela Kerins arrives at Leinster House today with John McGuire, Director of Fundraising. THE PUBLIC ACCOUNTS committee has announced it will be seeking legal advice on the publication of a document detailing the salaries of senior executives at the Rehab Group. Representatives from the group appeared before the committee today and there were a few tense back-and-forths between executives and Oireachtas members. 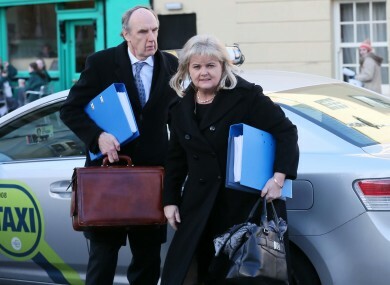 Shane Ross asked CEO Angela Kerins colleagues how much they earn but they all declined to answer, telling the committee that their salaries had been provided to “the accounting body”. The HSE’s director general Tony O’Brien said he would provide the information to TDs under absolute privilege. This evening the committee said that the document containing this information has now been handed over. The Rehab Group revealed earlier this month that Kerins is paid a salary of €240,000. Today she pointed out that salaries are not taxpayer funded and employees are not public sector workers. Email “PAC to seek legal advice before revealing Rehab executives' salaries”. Feedback on “PAC to seek legal advice before revealing Rehab executives' salaries”.